Kiper projects Cam Newton to the Redskins in latest mock draft. What would an offseason be without linking a big name to the Redskins? In his first Mock Draft for 2011, noted draft “guru” Mel Kiper Jr has projected that the Redskins would select Cam Newton, the much talked about Heisman Tropy-winning quarterback from Auburn University, with the 10th overall selection. A gifted athlete, Newton has good arm strength and size, has developing accuracy and continues to show that the more you ask him as a passer, the more he’ll develop… Newton’s skill-set is such that personnel people are going to become more enamored, if they already aren’t. Given the fact that Donovan McNabb will likely be moved at some point during this offseason (either via trade or outright release), and that Rex Grossman is probably better suited for a backup role, the early scuttlebutt around the Redskins and the draft is that they’ll likely be taking a close look at this year’s crop of quarterbacks. 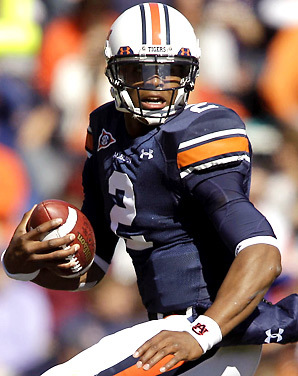 Along with guiding Auburn University to a National Championship, Newton was just the third player in college football history to pass for 20 touchdowns and rush for 20 touchdowns. He nearly swept the available postseason awards for a college quarterback, winning the Heisman Trophy, the Maxwell Award (best football player in the United States as voted on by the media and coaches), the Davey O’Brien Award (best college quarterback), along with winning the Walter Camp Player of th Year and Associated Press Player of the Year awards. It should be noted that Mock Drafts at this point in time are merely projections of a players current “worth” in the eyes of many scounts and personnel executives around the league. There are still numerous events that will factor into where a player is ultimately selected in April’s draft, including the Senior Bowl/Postseason All Star games (Newton will not be participating in any), the Scouting Combine, school Pro Days, and individual workouts.